The God of War games have always been a great fit between form and content. Mythical Greece was violent, marked by murderous rage, monsters, and revenge. Kratos, the Spartan warrior and unwitting son of Zeus, was a perfect distillation of this brutality — Achilles, Theseus, and Orestes, all in one. Through six games, Kratos slayed his way through the entire Greek pantheon and bestiary. Now, for his return, he’s sought snowier pastures up north in the land of Odin and Thor. It’s an obvious move on many levels, since the Norse canon (or what little we have of it) is even more focused than the Greek on tales of burly men slaying giants. The results surpassed our expectations, however. God of War (2018) uses Norse mythology masterfully, and not just for how directly it translates the subject and spirit of the Norse canon. The interpretive liberties that lead designer Corey Barlog and his team took with the source material embody a truer engagement with the mode of mythic storytelling than if they had simply executed a more ostensibly faithful version of the stories. Spoiler warning: Our analysis includes a few key plot points of God of War, including some mid-game plot points and the identities of several key characters. Proceed at your own risk! Compared to the body of Greek myth, very few Norse tales have survived. Most of what we know comes to us through the epic Prose and Poetic Eddas, and an inordinate amount of the stories contained therein revolve around Thor, the god of thunder, slaying giants. Right off the bat, Kratos is a good protagonist to fill those shoes. Although Thor is typically depicted as being more good natured (especially in his jocular, Marvel iteration) than the foul-tempered Kratos, both default to murder as their go-to solution for problems. Kratos’ new weapon, the Leviathan Axe, underlines the comparison; like Thor’s famous hammer, Mjölnir, the Leviathan Axe returns to Kratos’ hands from any distance when called after he throws it. The similarity isn’t a coincidence: The dwarves Brokk and Sindri forged both. One fact about the world in God of War becomes apparent the longer you play: There are almost no people in this world. 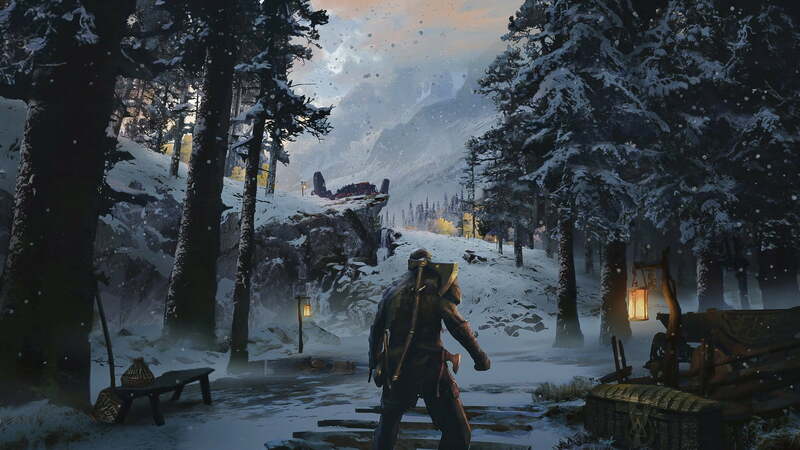 Early on, you encounter a few cannibals that try to make a meal out of Kratos and Atreus, and you speak with errant ghosts throughout, but most people you encounter are undead Draugr, and any corporeal characters you speak with are dwarves or gods. On one level, this makes sense in a world based on Norse mythology, as humans are actually largely absent from those stories. Where Greek myths often revolve around encounters between people and supernatural forces, humans are almost entirely incidental to the concerns of the Norse gods, who instead tangle with giants and one another while their human creations just deal with the fallout indirectly. As a god slaying monsters and fellow gods, Kratos fits right in. As a god slaying monsters and fellow gods, Kratos fits right in with other Norse mythology. The game does not directly make its case in these terms, but provides a specific explanation for humanity’s absence. 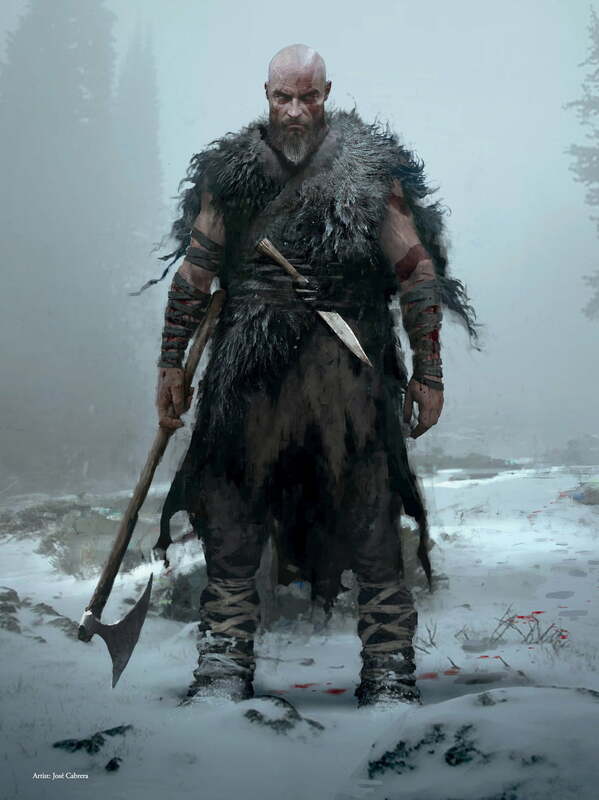 At a certain point, Kratos and Atreus discover that something caused Helheim, the realm of the dead, to stop accepting newly deceased spirits, causing the souls of the dead to rise up as undead warriors called Draugr, which, in turn, kill more people. It’s more or less a Norse zombie apocalypse. More than a convenient excuse to give Kratos a world full of enemies he can kill without hesitation, the story reflects the eschatological idea of Ragnarok, the Norse pantheon’s inevitable, world-ending battle. What’s key here is that Ragnarok is not the result of external, cosmic forces, but rather it’s the gods’ comeuppance for an eternity of cruelty to giants and monsters. For instance, the gods tricked and locked up the wolf Fenrir out of fear that he will overpower the gods and destroy the world, but ultimately, Fenrir wants to do that precisely because the gods betrayed him like so. Odin’s prophecies are often suspiciously self-fulfilling like that. If God of War is starting to sound critical of the gods, that’s because it absolutely is. As a general rule, pagan pantheons were often as much feared as they were revered. God as a benevolent force who’s primarily looking out for people is largely a Christian conception, whereas for ancient people the gods were usually the personifications of a cruel and uncaring universe, utterly capricious in how they treated mere mortals. God of War goes even further with an explicitly hostile stance toward Odin and the Aesir gods that he leads. 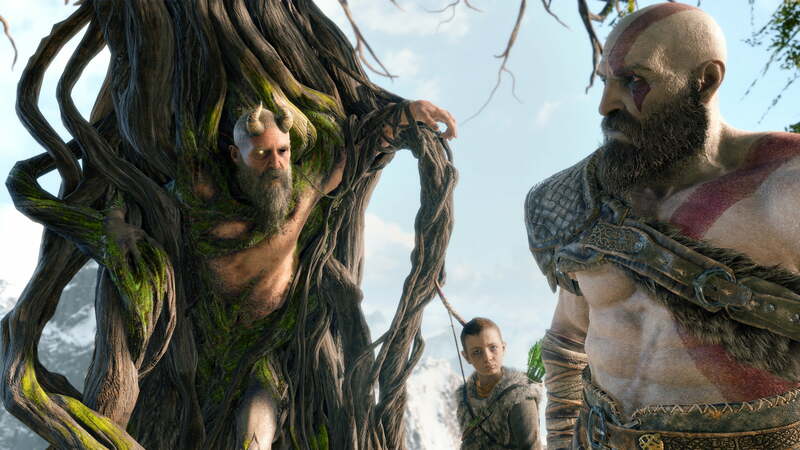 When the wise god Mimir eventually joins Kratos and Atreus on their travels, he regales you during downtime with myths of the gods, which are mostly a chance to neg on Odin. “Ruthless? Barbaric? Heartless? That’s Odin,” he scoffs, calling the All-father “a small, covetous tyrant,” that stole everything he ever had, starting with the very world that he made by murdering the giant Ymir. One of the main ways that players learn about the world is through Jötnar (giant) shrines throughout. These comic-style story boards relay myths as told by the giants (whom Mimir is quick to point out are more like people than monsters), the constant refrain is that someone tries to resist the gods, and then Thor comes and kills them. Mjölnir is rightly feared as a weapon of mass destruction, keeping the nine realms under strict Aesir rule. Painting Odin as a selfish and manipulative conqueror whose reputation as the benevolent All-father is just good marketing really isn’t that much of a stretch. Scholars suspect that the Aesir-Vanir war, a pivotal event in the Norse canon referenced in God of War, might reflect a historic conquest whose victors wrote their own mythic history, and thus digging into the implicitly brutal colonialism of the Aesir is an interesting and merited approach. It’s also not an uncommon one: Thor: Ragnarok makes the same point when Hela exposes how Odin came to rule the nine realms through blood and iron. Perhaps God of War’s most interesting mythic interpretation is how it handles Baldur, the universally beloved Aesir son of Odin and Freya. According to tradition, Baldur started having dreams of his own death, so his mother went out and extracted a promise from nearly everything in the world that no harm would come to her son. So protected, Baldur would stand before his fellow gods and laugh as they hurled all manner of weapons at him, which would harmlessly bounce off. Freya had missed one promise however: She thought mistletoe was too small and harmless to bother. On learning this the trickster god, Loki (always looking to cause trouble) crafted a mistletoe spear and gave it to the blind god Hodr and tricked him into killing Baldur. God of War’s Baldur shows up very early in the game, initially identified as The Stranger. (Astute players, however, might figure out who he is from his repeated insistence during the fight that he can’t feel anything). In this version, Freya’s bargain to protect him from all harm also protected him from all sensation whatsoever. Safe, but numb, Baldur goes mad from the isolation, and comes to loathe Freya for denying him a real life. That’s a pretty bold interpretation of the conventional story of Baldur, but retains all the core elements of the myth. Meanwhile, it also ties into the primary theme of God of War — the ways parents and children shape each other. Baldur’s state raises questions about how a parent’s desire to protect their children can actually harm them, or how being so universally beloved and beautiful can actually be cripplingly insulating. Baldur is the best example of how God of War engages not just with the content, but also the form of myth. Contemporary media is hugely preoccupied with originality. Even as we end up telling the same stories again and again, it’s crucial that we clearly delineate them as sequels or reboots. Fandoms are often at each other’s throats about which version of a story or character is the most correct, and what constitutes canon. God of War is an exemplary engagement with myth precisely because of the liberties it takes with its depictions of the gods. These stories are meant to be alive and relevant to our lives, and Barlog et al have done a fantastic job of exploring questions of parenting and breaking the cycle of intergenerational violence by digging into and not being too precious about the Norse canon (and the Greek — Atreus’ name is almost certainly an allusion to one of the most notoriously tragic families in ancient Greece). Kratos himself is a sort of modern myth. Now that gods in popular culture have come to often represent the dangers of unchecked power, Kratos is truly a god for the people who recognizes that the only way forward is to eliminate gods entirely. The iterative approach of this reboot feels especially mythic: This is the same Kratos we’ve seen before, but different. The essence is still there, but reconfigured to find new shades and new relevance to our lives today. There’s a valuable lesson here for all pop culture. The widely-mocked uptick in sequels, reboots, and revivals means that people are expressing a clear desire to tell certain stories again and again, but we’re stymied by litigious IP holders or over-protective fans clinging to the notion of originality as a virtue. Myth teaches us to let go, that the most important stories don’t come from single authors, but rather from the emergent voice of countless people thinking and feeling together over generations. We might have written Kratos off as a fleeting creature of his angsty, early-aughts moment, but if he can look back to move forward with such clarity, maybe there’s hope for the rest of us.